Built on the success of the K3020 Dual VCO, the K3021 Master VCO offers a single channel oscillator based on this famous design. 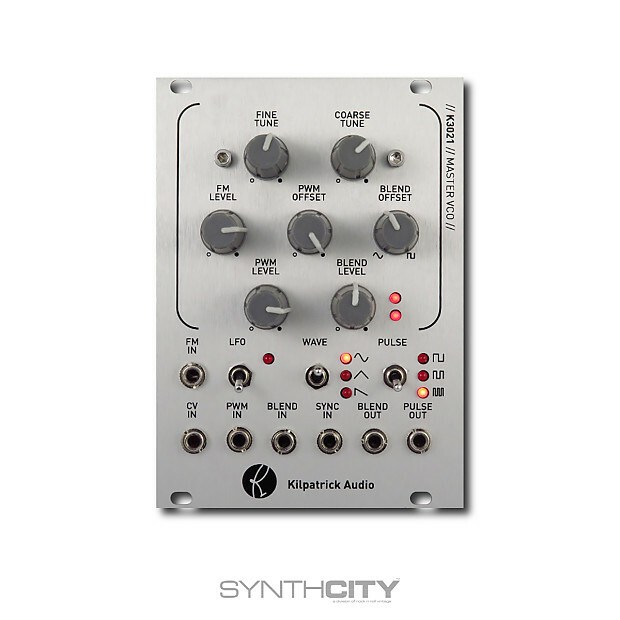 Completely redesigned to replace now hard to find parts, the K3021 uses a complete new triangle core design based around discrete transistors for an amazing tone excellent stability. Useful as both your main pitch oscillator and as a complex low-frequency signal source (LFO) the K3021 Master VCO is a workhorse module great for any system. One of the features that makes the K3021 extra special is its use of complex waveshapers and pulse width modulation circuits to create unique timbres. You can select between sine, triangle and ramp waveforms for the WAVE section. These waves then feed into the triple pulse width modulator to create very rich pulse waves that have a much more lively character than a simple single-channel PWM. Choose from one of three PULSE output combinations for unique variations. The BLEND and PULSE outputs can be used independently, or can be combined through the use of the ultra-low distortion blend section. Smoothly fade between the WAVE and PULSE waveforms either manually or with voltage control. By using the blend circuit especially with the LFO mode engaged, very complex modulation waveforms can be easily created. Based on purchase price of $325 at 10% APR for 12 months. Excludes tax and shipping fees, to be calculated at checkout. Rates range from 10-30% APR. Choose from 3, 6, or 12 monthly payments.